Home Food 6 Places to Get Excellent Flour Tortillas in L.A. It wasn’t long so ago that L.A.’s flour tortillas were only for wrapping supersized wet burritos at places like Manny’s El Tepeyac, or, occasionally, for the smaller bean and cheese varieties at Lupe’s #2, which fit nicely in your hand like an LP session shaker. If we wanted to get the real deal, homemade flour tortillas, we went to La Azteca Tortilleria for a tasty chile relleno burrito. Then came Burritos La Palma and its traditional northern Mexican burritos de guisado—AKA tacos de harina (flour). But with a few new players in the game like Loqui, a northern Mexican taqueria, and the upcoming Salazar, which will be making flour tortillas in house on a fancy press, this flour child can’t wait for the summer of taco love. Here are 6 places where you can get excellent tacos or burritos made with flour tortillas in L.A.
Carne asada tacos in flour tortillas, a northern Mexican practice, is now becoming common in L.A. with places like this sleek, Baja-inspired taqueria. Never mind that Baja is typically a corn tortilla state—Sonoran transplants introduced the flour variety that eventually became the standard in Mexicali. Get their mesquite grilled carne asada on a soft homemade flour tortilla for the superlative carne asada experience. This the only place in L.A. to find a northern Mexican burrito de guisado, a skinny burrito with a spoonful of refried beans and a stew of your choice like mouthwatering beef birria or chicharrones en salsa verde. 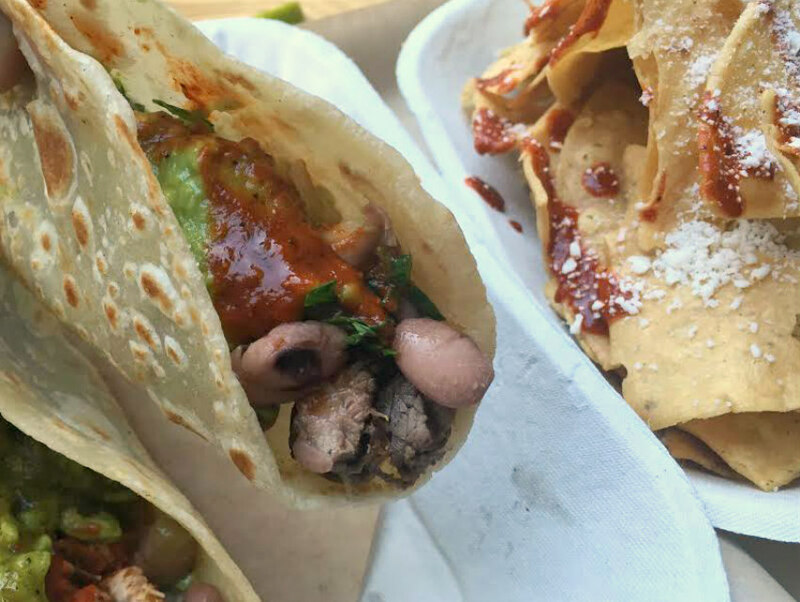 Now you can get burritos and tortillas from this Zacatecas-based chain in El Monte, at their food truck in Orange County, and the tortillas are on sale at the Chiles Secos booth in the Grand Central Market. The chile relleno burrito here is a bloated version of its Chihuahuan origins, but devotees swear by this hefty offering of a chile relleno, refried beans, steak and pico de gallo encased in a dry, coarse textured flour tortilla that’s made on-site. Get a dozen large flour tortillas to go and become a burrito master in your very own home. Take everything on your breakfast plate and throw it in there and boom—breakfast burrito. For years, Esdras Ochoa and Javier Fregoso, the dynamic taquero duo behind L.A.’s only Mexicali-style taqueria, have been making midnight runs through the Salton Sea to Mexicali to get their signature flour tortillas from a tortilleria in their hometown. Get carne asada, barbecued chicken, or put some melted cheese in there with a garlic aioli in their own rendition of a vampiro taco at the place that started this flour tortilla craze. A new Westside taqueria inspired by Sonora, one of Mexico’s greatest carne asada treasure troves, their signature . In Sonora it’s all about fine cuts of steak cooked over fire by experienced grill men–go with the ribeye, of course, on a flour tortilla. It’s too soon to see what Esdras Ochoa of Mexicali Taco Co. will be doing at his upcoming northern Mexican barbecue restaurant in Frogtown, but count on flour tortillas. Ochoa has brought in a special tortilla press from Sonora, Mexico that will make flour tortillas for taco and burritos. “We’ll be making four tortillas up to a 12’’ size—of course, those will be for burritos”, Ochoa wrote in a text message. We can’t wait!